Southern Ground-Hornbill ( Bucorvus leadbeateri fam. Bucerotidae) Kruger Park Birds & Birding. The Southern Ground-Hornbill (Latin name Bucorvus leadbeateri) is described in Roberts Birds of Southern Africa, 7th Edition and has a Roberts number 463. A full description is on page 158. The Southern Ground-Hornbill belongs to the family of birds classified as Bucerotidae. It is believed there are only between 1500 and 2000 of these birds left in South Africa. 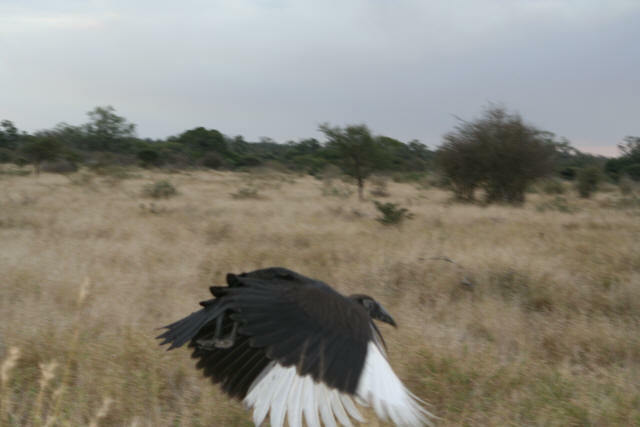 In June 2006 I saw Southern Ground Hornbills on 4 separate occasions in different parts of the Kruger and one of these sightings still intrigues me. I witnessed one of these birds kill a large Monitor Lizard. I have never seen any reference to the bird killing and eating such large prey before although it is recorded that they eat rock rabbits. The map of the Kruger you see on this page shows the areas (coloured orange) where this bird has been identified. You can see it at any point in the Park although the birds tend to have their own territories. Identifying birds can be difficult and you need to get an impression in a short as time as possible. However in this case it is virtually impossible to mistake this bird. If you see the bird flying you will note the pure white primary wing feathers (hidden from view when walking). Throat is red (with blue for female). This bird has normally proportioned long strong legs and spends most of its day walking along the ground looking for food which it will sometimes chase. If you see a bird carrying food in its mouth it probably intends to take it back to a fledgling in the nest. The Southern Ground-Hornbill feeds on the ground mainly and is almost totally carnivorous eating anything from insects to snakes and even monitor lizards as I witnessed above. The nesting habit of the Southern Ground-Hornbill is to create the nest in a hole in a large tree trunk between 2 and 5 metres from the ground. The bird lays eggs which are white in colour and number between 1 to 2 and the second chick which hatches some 4 or 5 days after the first one always dies from starvation. A project is on the go at Mabula to hand raise second chicks rescued from nests in the wild. They are reared in silence (from humans) also disguised. 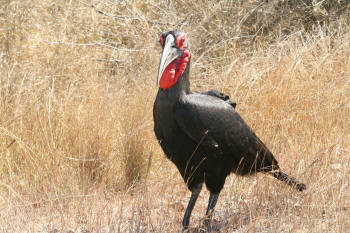 In this way the chances of re-introducing the Ground Hornbill into a wild group are much improved. Only recently has success been obtained in breeding these birds in captivity. Unlike other hornbills this species is not sealed into the nest. Adult birds only raise 1 chick on average every 9 years. Ground Hornbills live till about 50 years of age. You will normally see the Southern Ground-Hornbill in family groups of between 2 to 12 ... most members of the group are helpers to feed the offspring of the alpha male and female. The main reference source for this data was "Roberts - Birds of Southern Africa, 7th Edition"